Born in 1954 in Alma-Ata. Graduated from the Kazakh Polytechnic Institute named after V.I. Lenin. Master of Geological and Mineralogical Sciences. After graduating, she worked as an assistant, teacher and senior lecturer at the Kazakh Polytechnic Institute named after V.I. Lenin. 1991-1992 - Chief Geologist of geological party for production and technical Information of the expedition of geological and economic studies of the MinGeo Kaz SSR. 1992-1992 - Director of the GKP "Kazmineral" MinGeo Kaz SSR. 1992-1994 - Associate Professor of the Department of GSP of Kazakh Polytechnic Institute named after V.I. Lenin. 1994-2011 - Associate Professor of the Department of GSPI RMPP KazPTU named after K.I. Satpaev, Almaty. 1984-1986 - part-time Deputy Dean of the geological prospecting department of Kaz PTI named after. V.I. Lenin. 1994-1997 - Director of the private enterprise "Areal". 1997-2012 - Director of "Areal" LLP. 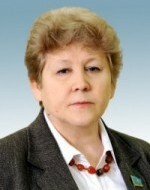 2012-2016 - Member of the Committee on Legislation and Judicial Reform of the Majilis of the Parliament of the Republic of Kazakhstan of the fifth convocation, Member of the Central Committee of the Communist People's Party of Kazakhstan, First Secretary of the Almaty City Committee of the KNPC, Member of the “People's Communists” fraction, Member of the “Assembly of the People of Kazakhstan”. Since March 2015 - President of ULA "Association of Production Geological Organizations of the Republic of Kazakhstan" on a voluntary basis. Since March 2016 - Secretary of the Committee on Ecology and Nature Management of the Majilis of the Sixth Convocation of the Republic of Kazakhstan, Member of the Central Committee of the Communist People's Party of Kazakhstan. She is an Honorary Prospector of the Republic of Kazakhstan. Shehas more than 40 scientific, scientific and methodological works on geology and higher special (geological) education, author of the textbook "Laboratory Methods of Mineral Researches."